I would have posted earlier but I spent five days in Sun Valley, Idaho hobnobbing with the rich and famous and skiing. I only skiied for 3 days but got in 100,000 vertical feet. That's over three times the height of Mt. Everest! The secret was that while the rest of the USA was lacking in snow, Sun Valley had perfect runs because they make a lot of their snow and the weather has stayed cold and kept the snow in perfect condition. So while Californians were whining about their 12 inches in the Sierras and having their ski lifts only able to open a couple of their 100+ runs, we skiied without crowds, in sunshine and on great snow. While Colorado, Montana, Utah, etc. cried over a lack of snow, we sooshed left, we sooshed right and laughed at our ingenuity in skiing to only place you could. Now, it doesn't snow much at all in Portland and this was just a dusting but an hour away in the mountains they were expecting 3 to 5 feet! So the drought of snow was over. What a difference a day makes. 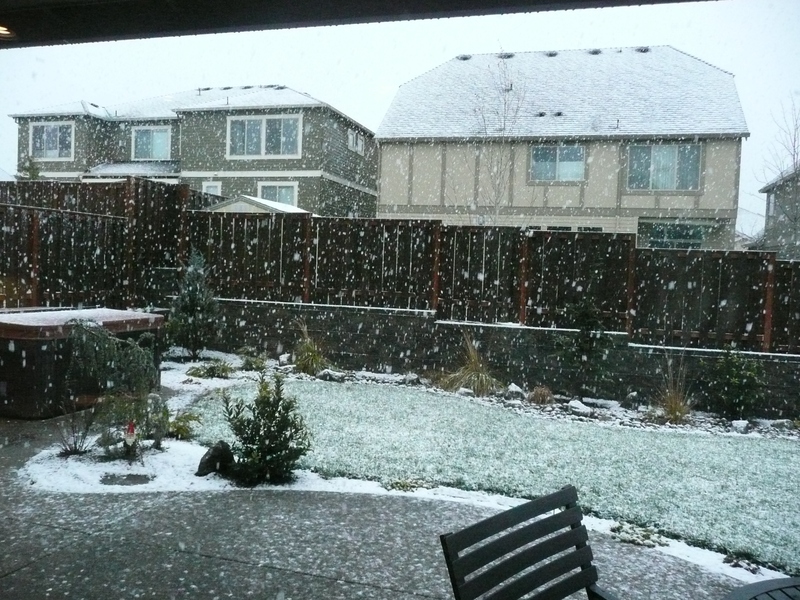 Oh, and yes, this little dusting brought out a weather reporter camped at every intersection in the city. Yes, nobody worked and everyone panicked in traditional Portland fashion. 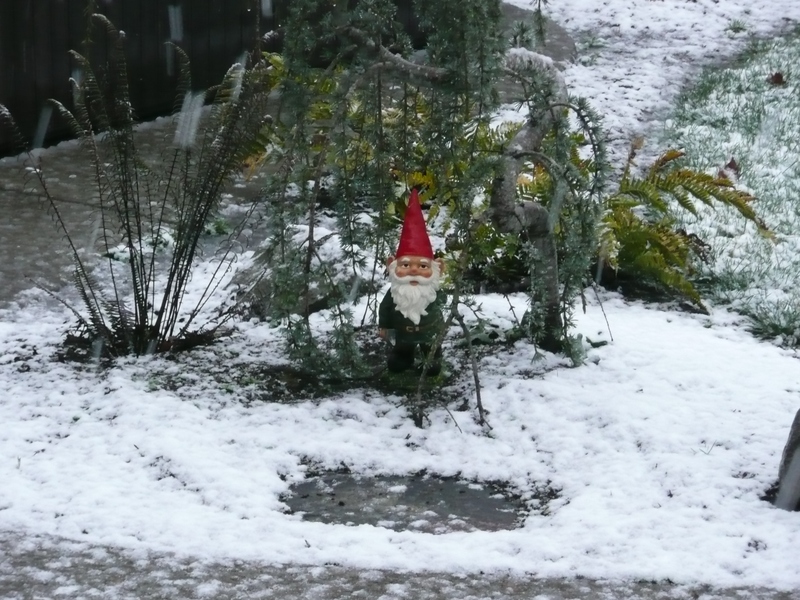 And yes, that is a gnome in my backyard. He's not amused with snow either! Utah is my favorite for skiing. Well, also Idaho. Still waiting on a decent snow here. We're getting screwed (so far)! Seeing how I don't ski and am fine enjoying snow at a distance, I would probably act like the gnomes and like it for about ten minutes and then hope it melts. Lots of snow just means more water for fighting our drought, and the mountains look prettier. But aren't you excited now that you can ski locally? If I skied, I would be. How did I know you'd have the bad taste to put a gnome in your back yard. love the gnome. what's his name? we had 8 inches before halloween, which is bizarre. then nothing. it hasn't even been cold enough for the slopes to make snow until just a couple weeks ago. just a crazy winter here. I think our local Eaglecrest ski area has the most snow of all the ski resorts in the states! I don't ski, but people seem pretty happy about it. We are supose to get another 12-17 inchesw tonight. Crazy! why isnt he helping you with travel arraignments to some place either warm or with tons of snow for more skiing? Sun Valley, now that's a good name for a place with lots of snow. ;) I know what you mean about a little snow bringing out the reporters and getting everyone into an uproar. That used to happen whenever it would snow in Southern California...of course, that only happened about once every ten years or so, so maybe it was justified. We lived in Portland for 3 years and missed the snow each year (as in, we happened to be in CA when it snowed. The year we moved was the year you got dumped on big time. sybil - Nothing wrong with getting screwed...oh, wait, I don't think you meant it that way. Nevermind. mother theresa - Strangely, Sun Valley is mostly sunny. They get dumped on and then it turns sunny right away. In fact, of the 7 straight years I have been going, it has never snowed while I was there and only 2 days have been cloudy yet the snow is usually fabulous. angie - See...you're causing the snow!